Botox is a very in-demand injectable beauty product used to give a rejuvenated and youthful appearance to facial features. Dermatologists inject the paralysis agent directly into the muscles around areas of the face that commonly develop wrinkles and fine lines like the forehead, corners of the mouth, and the deep lines on either side of the upper lip leading to the nose. The cosmetic amenity is so popular that people tend to talk about it the way we refer to other ubiquitously used products by their brand names to refer to the whole market. But like brand name bandages (you know the one), Botox is just one among the world of injectables that provide different benefits. Not all injectables accomplish the same result or work in the same way. There are also dermal fillers, which are injected into the skin to fill areas under wrinkles and lines to give a more plump and healthy look. This class of beauty aid targets an array of features on the face and body. They can be injected into the lips to restore definition, the cheekbones and cheeks to give volume, or to address those pesky circles under the eyes. Sometimes they are used in tandem with Botox to temporarily eliminate frown lines. They can even be used on the hands to recover their natural smoothness. We only use FDA approved sterile gels like Juvederm on our patients. This injectable consists of lab-tested hyaluronic acid, HA for short, a natural sugar compound that is found in human skin. HA is cross-linked with other polymers to safely provide the desired results. It was created to be used on the nasolabial fold, or those lines leading from the corners of the mouth up to the nose mentioned earlier. This product, as with other proven injectables, contains no animal or human DNA. 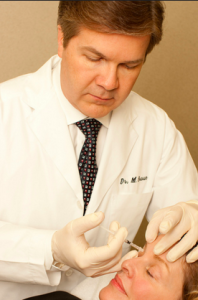 Botox utilizes neurotoxins to relax the muscles to achieve its cosmetic value. Don’t worry, the toxins are highly purified and completely safe when applied by our dermatologists during the procedure. Dermal fillers target different parts of the face and body in a different way. While they all produce a youthful aesthetic, it’s important that consumers are aware of the applications and distinctions in order to get the safest and most effective treatment available. Thanks to Dr. Braun on flickr of the image used in this post.